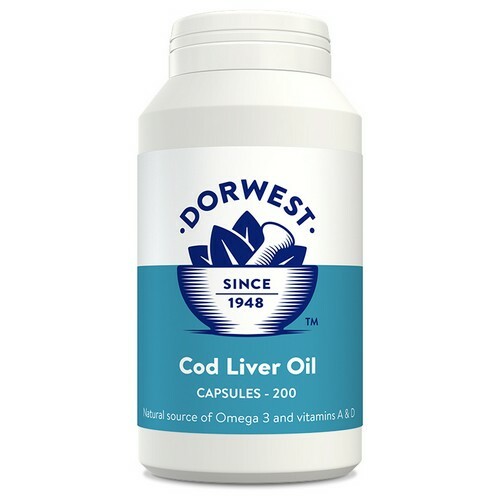 Cod Liver Oil capsules are an easy way to give a controlled amount of this valuable oil which is a good source of Omega 3 fatty acids and Vitamins A and D, essential for the absorption of calcium to maintain strong healthy bones. It assists in the maintenance of general health including helping to maintain mobile and supple joints and a healthy circulation in dogs. This fish oil provides energy that is slowly released to give extra stamina, so is a useful addition to the diet of working dogs. Helps the absorption of calcium to maintain strong healthy bones. Provides energy that is slowly released to give extra stamina. Helps to maintain mobile and supple joints and a healthy circulation. 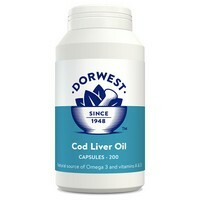 How Many Cod Liver Oil Capsules Do I Need to Give? 1 capsule per 10 kgs bodyweight daily. Especially beneficial in the winter months. Cod Liver Oil 315mg, Gelatin, Glycerin.